Pomegranate Sorbet - A recipe from Savor California, the online showcase for extraordinary gourmet foods and beverages from California. Combine in a bowl, cover and chill in refrigerator for at least one hour. 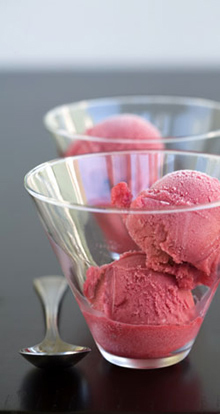 Pour chilled mixture into an ice cream maker and follow ice cream maker’s instructions. A light and refreshing dessert, or serve two small scoops as a palate cleanser between courses.